Lethal Weapon is an American 60 minute scripted crime television series, which kicked off on September 21, 2016, on FOX and is broadcast every Tuesday at 21:00. The show is currently in its 3th season. 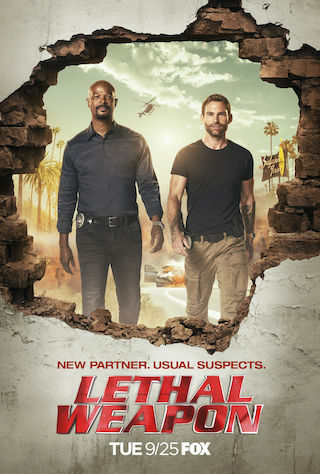 Combining action and drama with ride-or-die friendship and humor, Lethal Weapon reimagines the hit movie franchise, as it follows classic cop duo Riggs and Murtaugh, who work a crime-ridden beat in modern-day Los Angeles. Grief-stricken after the loss of his young wife and unborn child, ex-Navy SEAL-turned-detective Martin Riggs moves to California to "start over" at the LAPD. He's paired up with Roger Murtaugh, who's just coming back to the job after a near-fatal heart attack. Riggs' penchant for diving headfirst into the line of fire immediately clashes with Murtaugh's prudent, by-the-book technique.